Thoughts from Brahma Kumaris: The practice of positivity enables us to be stable under all circumstances. The practice of positivity enables us to be stable under all circumstances. Projection: Usually we find ourselves reacting negatively to situations. At such times we want to maintain a positive attitude but are not able to. We then work hard and think of ways to change the negative situation to a positive one. A lot of time and effort goes into it and we tend to feel tired. 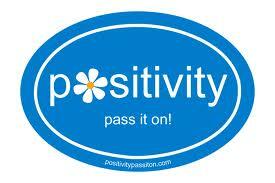 Solution: The solution lies in maintaining our own positivity rather than trying to change negative into positive. When we have a long time of practice of working with our inner positivity we will be able to be positive even in the most negative situation. Then we will be saved the effort of having to work at transforming our negativity. Keep a daily chart for one week for the questions below, the answers to which will help you manage emotions of anger, irritation, frustration, etc. more effectively. Review your progress at the end of each day and then at the end of one week. Having made your observations, make improvements for the next week. Keeping this chart for a month, will help you manage and overcome your anger much better. 1. During which event today did you get angry or irritated...even a little? 2. What was the type of your thoughts at that time? 3. Which negative thought/thoughts contributed to your stress the most? 4. What positive thoughts helped you to regain your calmness and composure? 5. How long did it take to regain your calmness? 6. Why did it take so long to regain your peace? 7. What would you do differently and more appropriately if the same scene happened tomorrow? To use the treasures within is to increase them. Trust brings help from others. To be able to bend means to be a giver. The ones with pure love bring benefit to all. Happiness increases when given to others. Anger comes where there is discontentment. To think less is to remain happy.